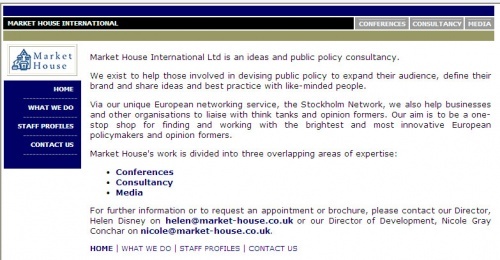 Market House International (2003-2006), was a Public Relations (PR) consultancy created by Helen Disney and Rick Nye to run the Stockholm Network of neoliberal think tanks. The Stockholm Network had been operating since it was set up by Helen Disney in 1997 and was closely connected to Swedish think tank Timbro. 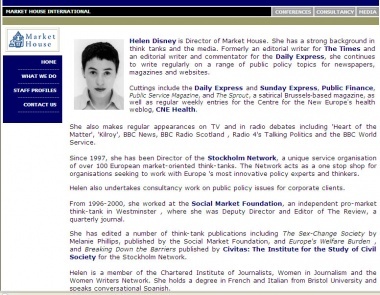 Helen Disney set up Market House International in 2003 and the company operated until 2006 when it was renamed as the Stockholm Network Ltd.
On the incorporation of Market House on 5 November 2003, Helen Disney was listed as its director and former Times journalist, and director of Populus Rick Nye was listed as the company's secretary. The company's original website published staff profiles of Disney alongside those of Nicole Gray Conchar and Sacha Kumaria. The Stockholm Network, which presents itself as a pan-European think-tank co-ordinating body, turns out to be in fact the public face of Market House International, a PR consultancy that tells corporate clients that the network gives it "local capacity to deliver both local messages and locally tailored global messages in a wide range of countries". Sensing a lucrative business opportunity, PR consultancy Market House International (MHI) have recruited around 130 free-market European think tanks, including the Adam Smith Institute, into a coalition: the Stockholm Network. It offeres 'both local messages and locally-tailored global messages', backed by 'Europe's brightest policymakers and thinkers.' Many members of the network do not understand just how commercial it is. Sacha Kumaria, the network's director of programmes, admitted that it does take corporate funding, from Pfizer and others, but declined to say how much. In addition to its networking and think tank role, the Stockholm Network operates a commercial consultancy firm called Market House International Ltd. According to the Stockholm Network website, Market House International is "host to the Stockholm Network". Market House International Ltd describes itself as "an ideas and public policy consultancy". Staff include key people from the Stockholm Network headquarters and Nicole Gray Conchar from the International Policy Network (IPN). The presence of this commercial consulting arm creates further confusion about the Network's funding and web of influence. For example, is it Market House International Ltd. or the Stockholm Network that organises 'think tank tours' and other outreach to promote prominent neoliberal figures like Johan Norberg? Beyond the Stockholm Network, Market House International also works for "a range of corporate and other clients, providing background research, advice and expertise in the public policy sphere." The complex web of interaction and financing only acts to further emphasise the need for financial transparency which details how much funding comes to which institutions and for what purpose. This page was last modified on 29 June 2010, at 13:30.